Those of you who have been following our escapades for a while know that we love pizza. Whatever city we visit, we always try to add at least one good pie to our list of meals. Des Moines, Iowa was no exception, but it did deliver our treat with a twist. During the planning stage of our trip I reached out to many of the Des Moines locals through a restaurant Facebook group. (This is an excellent tip for those visiting a new city.) Throughout an ongoing conversation feed, it became apparent that Fong’s Pizza was the one downtown pizzeria that had to be added to our itinerary. We want to thank the Catch Des Moines and Travel Iowa for their hospitality. Rest assured that all opinions are our own. We made our way to the downtown side of the river, (We were staying in the East Village) and easily found the restaurant. Tucked into an area filled with restaurants, nightclubs and shops, Fong’s exterior looked more like a Chinese food establishment. We had been warned that this place is extremely popular, so we planned our visit to be after the lunch rush had subsided. Even with the mid-afternoon timing, the place was still pretty full. During our time there we saw a steady stream coming and going, but then some looked to be picking up to-go orders. 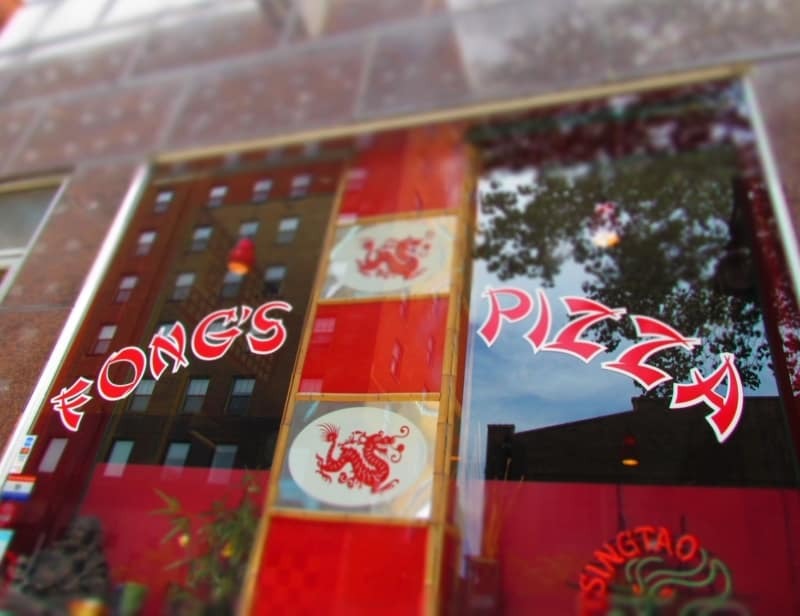 Fong’s could be described as a pizza joint with an identity issue. Not only is the menu a little unexpected, but the place also serves as a Polynesian Tiki bar. An assortment of unique goblets are available to hold your cocktails. (You can buy them if you wish.) After placing our drink order, we took some time to examine the interior. Once again the feeling that this is a Chinese food establishment was overwhelming. While I snapped some photos for the article, I noticed a group of friends having shots. It is obviously a ritual to wear the racing helmets while doing this activity. They were nice enough to pose for a picture, and then explained that they were celebrating one of them recently becoming a doctor. The reason they gave for their choice of celebratory digs was that they lived off of Fong’s Pizza while attending college. Almost everyone we spoke to told us we had to try the Crab Rangoon pizza. While we know that this dish is delicious, we had already sampled that flavor at another Iowa pizzeria in the Amana Colonies. (You can read about that experience here>) Instead we wanted to test one of their other specialty pies. With names like General Tso’s , Fongolian Beef, and Sweet and Sour Chicken the choice of choosing one flavor became difficult. We finally landed on the Thai Chicken pizza which includes; peanut sauce, spicy Thai chicken chunks, mirepoix (diced vegetables), Asiago and mozzarella cheeses. Topped with fresh cilantro this pie had lots of flavors working together to deliver a power packed taste. The crust was thin enough to have a touch of crunch, but still substantial enough to hold in all of the toppings. We were certainly impressed with this East meets Italy combination. After we completed our pie, the manager brought out a little surprise for us. (Thank you, Jeffrey Diemler!) 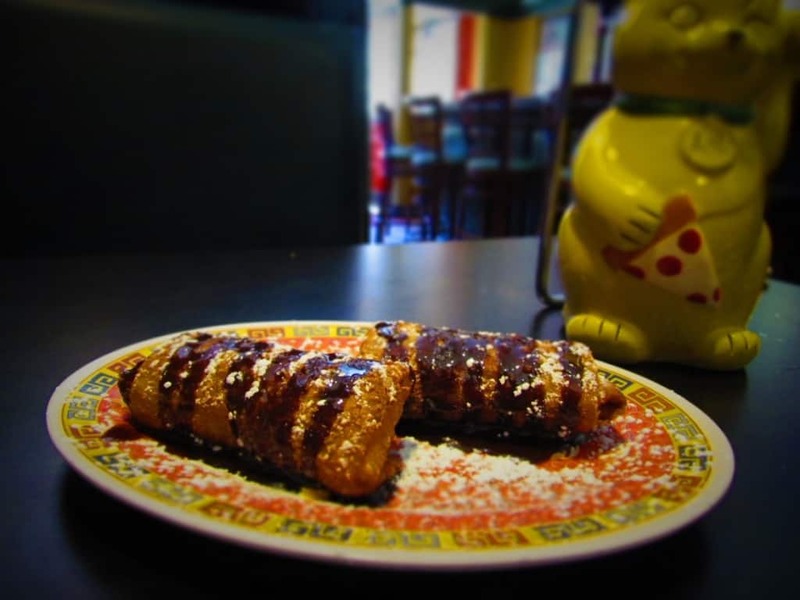 Raspberry Cheesecake Egg Rolls are another unexpected adventure at Fong’s Pizza. Stuffed with a sweet cream cheese filling and raspberry compote, the rolls are fried and drizzled with chocolate sauce, before being dusted with powdered sugar. Yeah, they are a little decadent, but oh so tasty. Even though we had dessert plans for later, we couldn’t pass up these tasty treats. Fong’s Pizza is part of a family of downtown establishments that serve up eats and drinks to the locals and travelers alike. 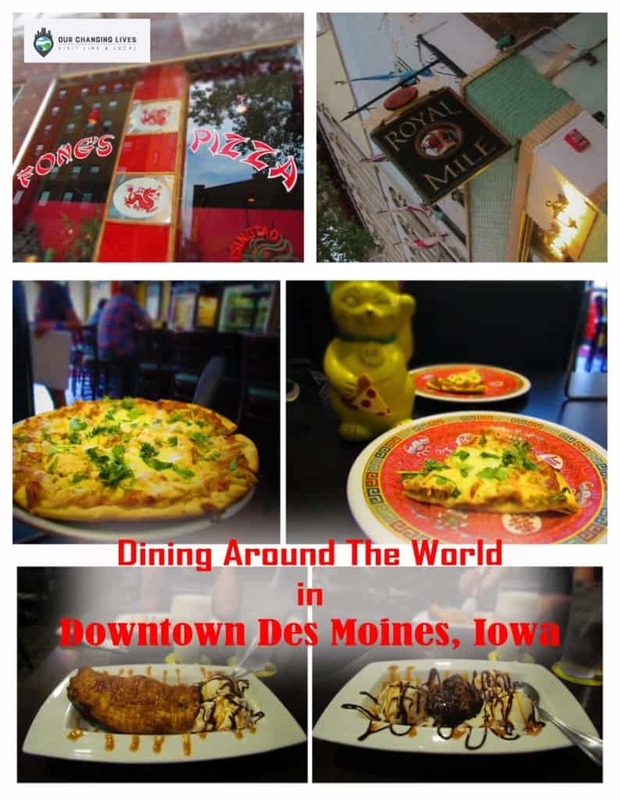 Names like El Bait Shop, The Red Monk, Hessen Haus, and The Royal Mile are synonymous with the downtown dining scene in Des Moines. We didn’t realize the connection when we made our plans for the day but it worked out well. Later in the evening we returned to the same block where we had enjoyed such a delectable lunch. This time we were on our way to an English style pub for an after dinner dessert run. The Royal Mile sits on the opposite side of the street and just a couple of doors down from Fong’s. We were beginning to become very familiar with this area. Do Calories Count On Vacation? During our visits we usually try to add in at least one dessert stop. These will usually be a bakery or ice cream shop. 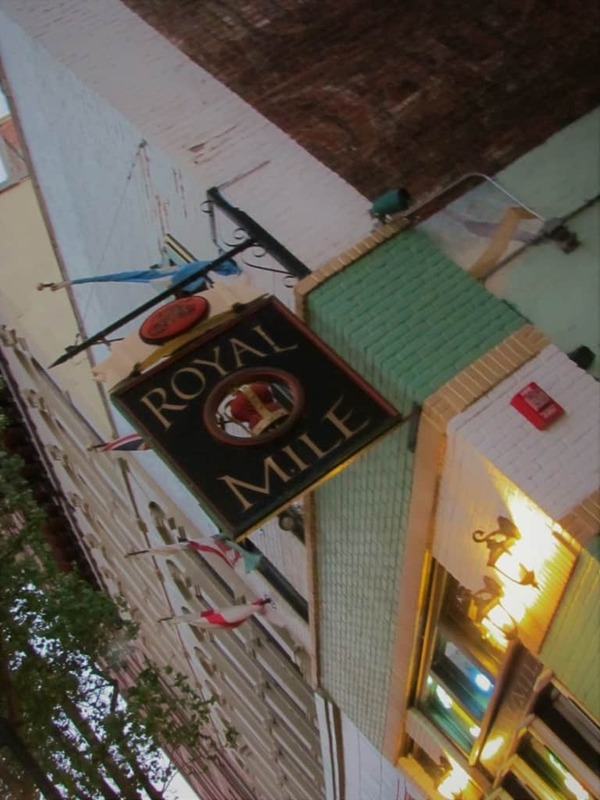 The Royal Mile was an unlikely choice, but ended up being a home-run pick. We were struggling to choose between the Apple Cinnamon Pasty and the Salted Caramel Pretzel Brownie, so we just ordered one of each. Wow! These desserts were amazing. The apple dish was like a smaller version of an apple pie with a deliciously flaky crust. To compliment this homey goodness, they toss in a couple of scoops to make it Ala mode. The brownie was baked to perfection with a little crust along the edges, but still gooey in the center. This too had the ice cream accompaniment that helped moderate the chocolate overload. Upon delivery of our order, we noted that we could just eat a portion to get a good taste for their dishes. A little while later, we were staring at empty dishes. Good thing our trip was designed to be a walking adventure. Have you ever dined at either of these restaurants? Tell us about your experiences in the comments section below. We would love to hear about the other pizza flavors. Thanks! Like this article? Don’t keep it to yourself. Share it with friends! I agree! Thank goodness for walking. It permits us to feast on such wonderful foods! That’s for sure. Even with all of the walking we have to scale back when we return home. That was Crystal’s favorite of the day. The brownie was gooey, which is her favorite. I loved the apple fritter dish. Oh my, I think I just gained a couple pounds reading this post! Mouth-watering photos! Thanks! Yeah, there were definitely some calories involved there. Fun post! It shows how you can find great food and fun food experiences everywhere you go if you look for it. Exactly and we didn’t even expect the dessert egg rolls. Bonus!